In the main I am a glass artist with glass fusion as my passion, I adore the tactile nature of glass. Having said that I am attracted to most artistic mediums and tend to mix my media, hence my enduring love for Mosaic and textures. In Exeter where I live I have the best of both worlds being the capital of Devon it is a small city with a long history surrounded by the countryside, moors and coastline. The South West is over flowing with an abundance of artistic inspirations. My artistic inspirations are very varied like my use of materials. I love nature and am very inspired by the local flora and fauna. I am creatively motivated by buildings, landscapes/seascapes and abstract pattern. My creative process is sometimes influenced and inspired by other artists including Chagall, Klee, Hunderwasser, Klimt and Gaudi I love their use/mixture of bold colours. I admire David Hockney’s work especially his most recent work, painting nature as he sees it not as we expect it to be. The work of photographer Gregory Crewedson intrigues me it can be quiet dark and very thought provoking. I love poetry and find the written imagery very powerful. Generally I have a relaxed style, free flowing I am not at all regimented. I can be inspired by the sights that I see around me , or at other times it comes totally from within. I love the building up of multilayers of colours you can create with glass & textures you can achieve with the found materials I can use in mosaic. Sometimes I leave a piece partially completed so I can live with it and just let it grow over time. My art is about playing and experimenting to create something desirable. 2014 New glass piece created for The Dylan Thomas International Glass Award, International Exhibition at the Waterfront Museum Swansea. In response to a series of events occurring in 2014 to celebrate the centenary of Dylan Thomas the University of Wales Trinity Saint David has launched two International competitions for Glass and Poetry. Glass artists worldwide are invited to submit a decorative or stained glass panel in response to the word "Harmony". Watch this space to see if we get accepted. I will then post a picture of the piece that has been created. 2013 Completion of 11 Mosaic panels 6ft by 4ft on the outside of UKPN power sub station in Osborn Street, Whitechapel, London. Pictures created by the schools in the Tower Hamlets brough, working with main Contractors Laing O'Rouke and Client UKPN. 2013 design and created screen printed glass panels showing UKPN logo for UKPN. 2011 Completion of Teighmouth mosaic panels 4 panels, 17 metres in total length pictures provided by the children of Inverteign school and converted to mosaic by Opus Mosaic. Working with main contractors Midas. 2008 Completion of large mosaic panel for Tesco Extra Exeter. Working with main contractors Costain. 2006 to 2013 Curate and co-ordinated 9 mosaic exhibitions, 6 exhibitions being international. International year of Planet Earth in 2006 was supported by UNESCO. 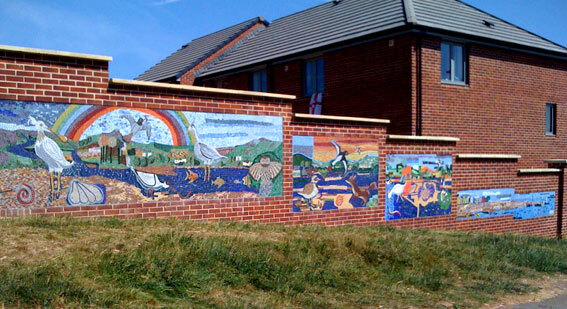 2004 to 2014 running gallery dedicated to mosaic and mosaic artists in Exeter, Devon. 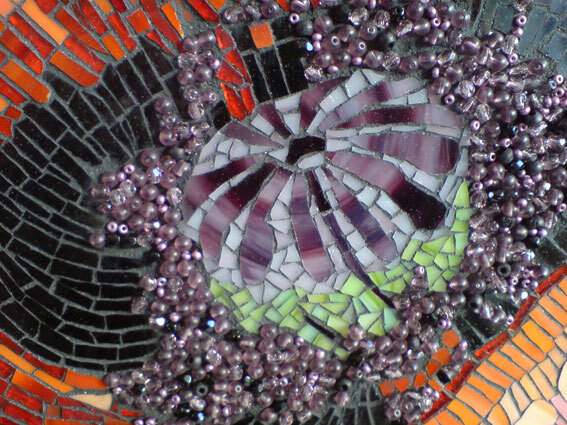 2001 Teaching mosaic classes to beginners and more advanced students on a weekly basis. 1999 started Opus Mosaic as a business with first retails outlet. 1989 to date independantly working as artist with mixed media mosaics and fusing art glass. I have created comissions in mosaic and glass for commercial and private clients.